The green building sector in Thailand continues to grow with support from both the government and an increased recognition of climate change and global warming. Indeed, Thailand participated in the 2015 United Nations Climate Change Conference in Paris and is now planning to reduce emissions by 20% over the next 15 years as well as double renewable energy production by 2040. It was the 21st yearly session of the Conference of the Parties (CoP) to the 1992 United Nations Framework Convention on Climate Change (UNFCCC) and the 11th session of the Meeting of the Parties to the 1997 Kyoto Protocol. Significantly, the conference negotiated the Paris Agreement, a global agreement on the reduction of climate change, the text of which represented a consensus of the representatives of the 196 parties who attended. In parallel, there has also been a growing awareness of “healthy buildings” within Thailand’s building and construction industry and a recognition of the relationship between design and health and wellbeing. Atelier Ten Bangkok has been consulting with Fragrant Group on a new mixed-use resort masterplan in Sattahip called the Sixth Element. The primary focus of the project has been the promotion of active lifestyles and health and wellbeing. Serving as “holiday” or second homes, the project, with a beachfront on the eastern seaboard, has focussed on the creation of both healthy indoor and outdoor spaces that promote not just active family lifestyles but create spaces for families to spend quality time together as well as providing areas for quiet relaxation throughout the masterplan. A lush and natural landscape, which stretches over 300 meters, connect the residential towers and the Evason Resort to Na Jom Tien beach. Moreover the project, which sits over a developed site, will incorporate landscape features such as bioswales, rain gardens and a native vegetation zone. Natural vegetation is deemed key to promoting biodiversity around the site in order to create a healthier environment for residents. The project will also provide a cycle network and bicycle nodes to promote a cycling culture within and around the project site. 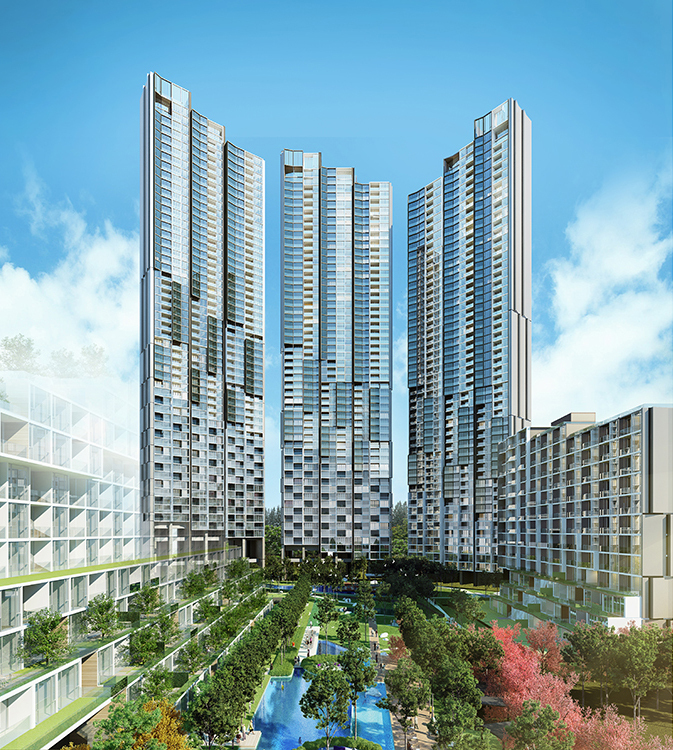 At the Sixth Element, Fragrant Group will also provide energy recovery ventilators for all residential units as part of the project‘s goal to providing a healthy environment for its residents. In a tropical climate setting, a central ventilation system is not so common even for high-rise residential buildings because of an abundant availability of natural ventilation. Nevertheless, because of the recent haze from Indonesia that has travelled as far north as the eastern seaboard of Thailand, energy recovery ventilators will filter as well as exchange indoor cool air with outdoor tempered air to provide fresh outdoor air, while minimising energy use to remove humidity from the air. Overall, the environmental design strategies work together to create an integrated, active and pleasant environment for residents and guests who will spend vacation time at Evason resort. Atelier Ten Bangkok is at the forefront of the emerging health and wellbeing design trend in Thailand and the Sixth Element, when complete, will serve as an exemplar project.